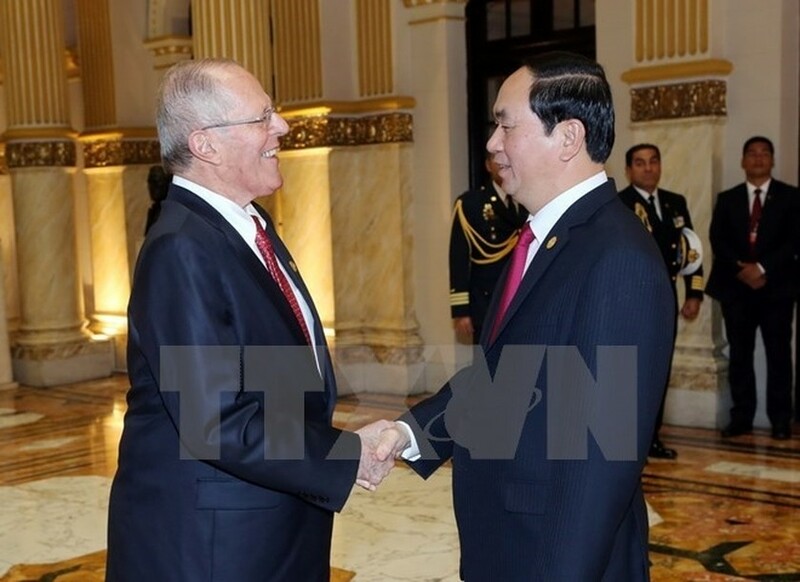 President Tran Dai Quang and his Peruvian counterpart Pedro Paplo Kuczynsky discussed in depth ways to strengthen bilateral ties during their talks in Lima, the capital city of Peru on November 18 (local time). The Vietnamese President is in Peru to attend the 24 th High-level Week of the Asia-Pacific Economic Cooperation (APEC) forum from November 17-20. In order to take bilateral ties to a new height, both leaders agreed to increase the exchange of high-level visits as well as those at ministerial, local and business levels, and hasten the signing of cooperation agreements in diverse areas, especially in telecommunications and oil and gas. They pledged to offer all possible support to the two countries’ businesses to access Southeast Asian and Latin American markets. On regional and global issues of shared concern, the Vietnamese leader underscored the importance of strengthening collaboration to maintain an environment of peace and stability for development. The two Presidents expressed their satisfaction with the increasingly effective coordination between the two countries at regional and global mechanisms such as the APEC, the Trans-Pacific Partnership (TPP) and the Forum for East Asia-Latin America Cooperation (FEALAC). The guest suggested joint work to be continued to implement a memorandum of understanding (MoU) on cooperation within the APEC framework, thereby ensuring the success of the APEC Peru Year 2016 and APEC Vietnam Year 2017. Following the talks, host and guest witnessed the signing of three cooperation deals, including an MoU on fishing development, a cultural cooperation agreement and another one on the control of psychotropic substances, drugs and drug precursors. Earlier, President Quang attended and delivered a speech at an exchange with Peruvian businesses, briefing them on Vietnam’s economic integration, including its economic partnerships with 224 markets. The country has also signed 90 bilateral and six regional free trade agreements, and actively joined regional and inter-regional cooperation mechanisms. Vietnam is adopting a range of measures to improve business climate, making it easier for foreign investors, including those from Peru, to do business in the country, he said. The President affirmed Vietnam’s policy to enhance friendly and cooperative ties with Peru as one of the priority markets, adding that the Vietnamese State will continue refining legal framework to ensure the rights and interests of foreign investors. According to him, the bilateral trade ties are yet to match each side’s potential due to geographical distance and limited investment. Therefore, the two nations should work harder to increase cooperation in the fields of agriculture, fisheries, construction materials, software services and mining. 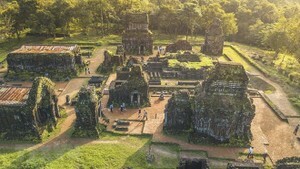 The Vietnamese President proposed the two countries’ firms pay more visits to each other to learn about the markets and discuss possible ventures.